In 2001, Ratty (a secret alias of German hard dance group Scooter) released Sunrise (Here I Am) to DJs and to the general public. At the time, DJs often refrained from using Scooter tracks in their sets because they considered Scooter's music to be heavy on the "cheese" factor. But they were none the wiser when a vinyl by the unknown Ratty hit their decks; the crowds loved it, and when DJs discovered it was actually Scooter in disguise, they were floored, to say the least. It didn't do amazingly well on the sales charts, but it at least proved that the fellows from Scooter could surprise even the most hard-headed of DJs. 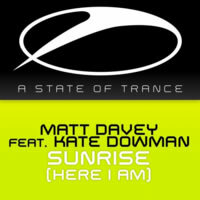 Fast forward to 2013 with relative newcomer Matt Davey, who is currently signed to A State of Trance, a sublabel of the massive Armada Music, founded by, among others, the almighty Armin Van Buuren. Matt has taken the original Ratty classic and basically updated it to fit the modern style of trance. There are two songs to this release. First is the Original Mix, giving you the full experience. Though it starts with some general dance music sounds and a pumping beat, Matt has channeled the spirit of Ratty. With some chopped-up vocals (not out of place in a modern Scooter track), Matt leads us to that techy bassline that made the original so captivating back in 2001. Afterward, some deep angelic pads underlie the suitable vocals of Kate Dowman, delivering the same lyrics as in Ratty's version, which were actually from "Song to the Siren" by Tim Buckley way back in 1970. The melody from Ratty's version is also fully present here in full force to create the remainder of the track, albeit with some slightly more modern sounds. The ultimate feeling while listening to the track is still the same, though: definitely top trance. Unfortunately, it's more or less the same song, just with a fresh coat of paint (but still in the same tone). There's also a Radio Edit, cutting out much of the fat and leaving us with only the key points of the Original Mix. For someone with little time to spare in life, they can enjoy this, but my money's on the full-length mix. If you liked the original, you're extremely likely to enjoy this single as well, considering it's heavily based on Ratty's rendition. It would have been nice to have some remixes, or better yet, to really see some unique flavour and character aside from a few new sound effects here and there, but for those who missed out on the original, this one sounds fresh enough to keep today's tranceheads pleased for a while.